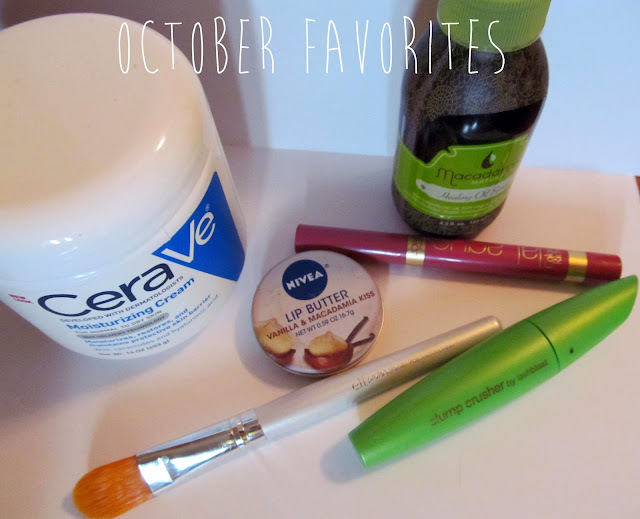 It's been a while since I've done a "favorites" post, but October brought some new (and some old!) 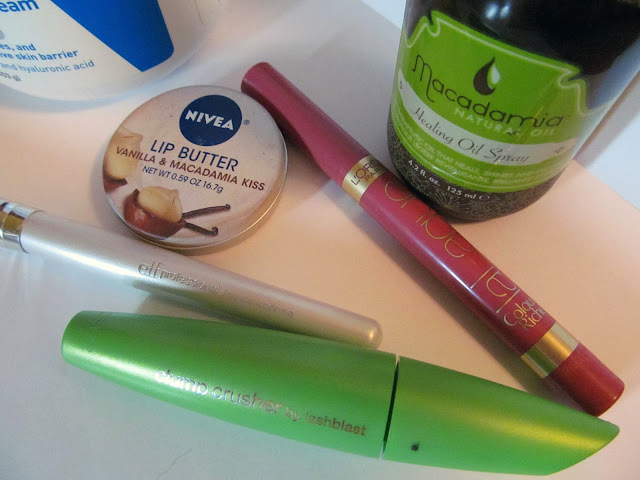 products in to my makeup and hair regimen that are worthy of talking about. Here's what I've been loving this past month. Covergirl Clump Crusher by Lashblast Mascara - Ohhhhh my word, what took me so long to try this stuff out?! This is easily going to be a part of my mascara collection from here on out because it's just that awesome. You can layer this on as thick as you want and you can bet your lashes won't get clumpy. This is an awesome drugstore mascara, and it costs just $6.99! Macadamia Healing Oil Spray - This is a holy grail product of mine that I won't ever go without again. This will make your hair silky smooth and it will smell absolutely amazing while doing so. I use it once a week on second-day hair to keep my hair moisturized, tangle-free and shiny. CeraVe Moisturizing Cream - I've got the big daddy tub of this stuff because I use it daily, but I need so little to moisturize my whole face that I think I'll have this for a lifetime. If you've got dry skin, especially if you are prone to a dry face, this stuff will keep your skin moisturized all day long without breaking you out. Look for it at any drugstore. Nivea Lip Butter in Vanilla & Macadamia Kiss - I'd heard the hype about these lip butters all over the internet and I finally gave in to temptation one day during a stroll around Ulta. I don't regret my purchase for a second. This stuff smells like a dream, it's creamy and soft on the lips, and it is so moisturizing. 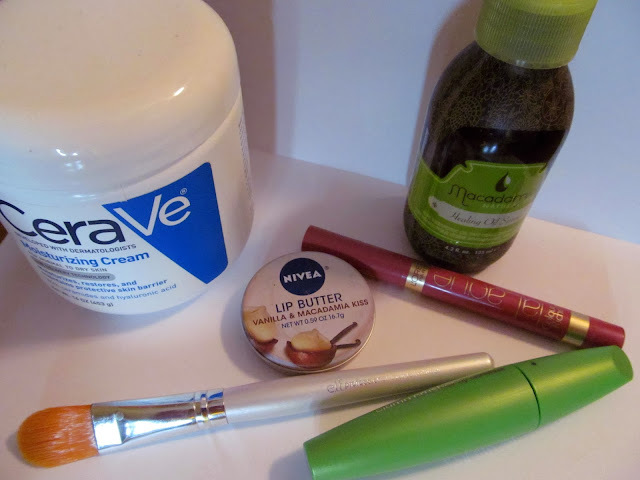 You can find these at any drugstore for under $5. e.l.f. Professional Foundation Brush - To be honest, I think this would make for a horrible foundation brush. I don't use it for that. I actually use it to set my under-eye area after using concealer. It's cheap, it works well for what I use it for, and I use it nearly every day! You can pick this brush up at Target for just $1!! L'Oreal La Laque Lipstick in 411 Never Lacque-ing - I won't go in to detail on this as I did a full review here, but I am so obsessed with this color. It is a natural dusty pink that is ultra shiny and really pigmented. I've been seeing these clearanced out at Target and Walgreens, so sadly I think these lipsticks are limited edition. Grab them while you can!